Use your Ninja Skills to Scratch and Win! Buy a Ticket! 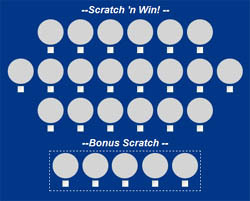 Scratch off three symbols, and one bonus multiplier (if you bought a SuperTicket), to win awesome prizes! You can scratch them off one at a time, or all at once! Then, if you bought a SuperTicket, pick one bonus multiplier! Billy 1x, but get it with the Three-Billy Jackpot for a Claymore! Blue Potion 1x, but get it with the Three-Golden Jackpot for a Sho Nuff Elixir! Legacy- Your bloodline shows you the Billy Bonus Spot! RedEye- Your bloodline shows you one Random Symbol! WhitEye-Your bloodline shows you the x1 Bonuses! You may only buy 100 scratch tickets per day before it stops you from buying anymore. Your scratchin' fingers hurt too much to get more tickets today! You have a 0.00385964912% chance of getting a Sho Nuff Elixir per SuperTicket by scratching 4 random spots. As such, it would take over 50,000 tickets to actually get a statistically significant chance of winning. The Sho Nuff Elixir's effect allows you to get the item The Glow: +1 Levels, +1 Successes, +1 Range, +1 Strength. 1. Get with a Billy multiplier for a Claymore!